1stC BCE coin of the Redones of NW Gaul, now Brittany. In the coins of this tribe, the female rider is usually armed. …When she had thus allured the male part of the Island, she pretended one day to go a progress through the provinces, and being attended by all her adorers on foot, while she rode on a milk-white palfrey, in a kind of triumph at the head of them: she led them into a deep river, which by her art she made seem passable; and when they were all come a good way in it, she caused a sudden wind to rise, which driving the waters in such abundance to one place, swallowed up the poor lovers to the number of six hundred in their tumultuous waves. After which, the sorceress was seen by some persons who stood on the shore to convert herself into a bat, and fly through the air till she was out of sight; as did her palfrey into a sea-hog or porpoise, and instantly plunged itself to the bottom of the stream…. George Waldron – ‘A Description of the Isle of Man’ 1731 – legend of ‘Tehi-Tegi’. 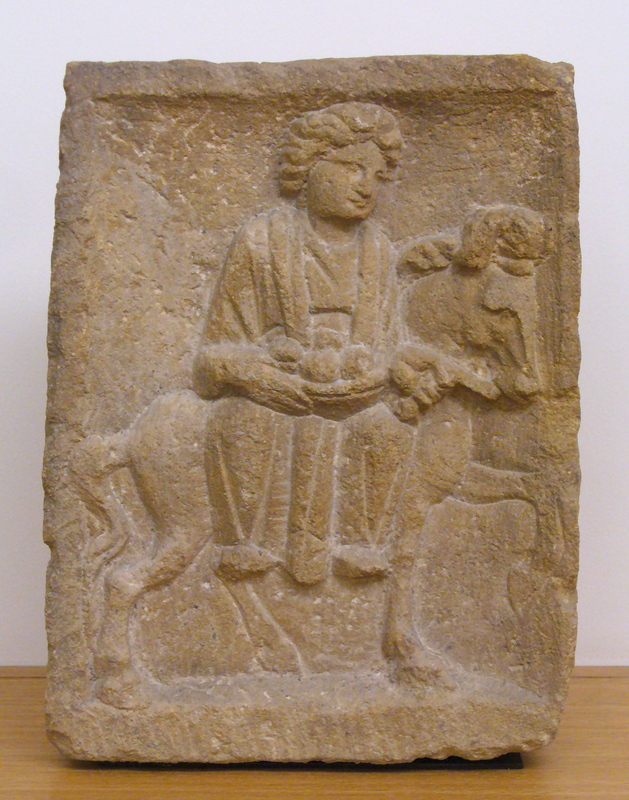 Cuddly mother Epona – the original would have brought your head on a plate, not food! The ‘Tehi-Tegi’ legend from the Isle of Man is perhaps the most overt survival (maybe matched by some Cliodhna legends of Ireland) of the ‘death-dealing horsewoman’ that the Iron Age celts were so enamoured of, but the principle has survived in many other forms. Most notable of these are the folktales of the fairy horse who kills people that try and ride it by jumping into water. Be it the Neck, Nykyr, Nixies or Rhinemaidens of the German and Scandinavian legends or the Kelpie of the Scots myths: all are related the same belief – a woman who conducts the dead to a realm under water. When we examine the fairy lays of the middle ages (Lai de Graelent, Lai de Lanval) we can see that the beautiful ‘fairy woman’ ends up conducting the tragic hero to a deathless realm through water. No wonder so many early Christian saints such as Kentigern spent their days mortifying themselves in water! The Germanic words used for the water-horse-spirit generally revolve around the word-root ‘nik-‘ – from a presumed Proto-Indo-European (PIE) neigw which means ‘wash’ – from which the Irish have nigh and in folklore the fairy washerwoman, the Bean nighe. The most famous portrayal of a Bean nighe in medieval Irish literature is that of the Morrigan washing bloody armour at a ford in the death tale of Cuchullain – part of the Ulster cycle. The Scots word ‘Kelpie’ is an allusion to what is also known in the gaelic world as ‘wrack’ (seaweed) which is also the Brythonic word for ‘hag’ – Gwrach or Groac’h. Martin Martin recovered a tale of Hebridean islanders in the 17thC sacrificing to a sea-god called ‘Shony’ (‘Old One’) in order to receive wrack from the sea to spread on their crops as manure. So there you have it – the military horsewoman on the Celtic coins is the Slachdan-weilding Cailleach – the Morrigan herself: The water woman of the fairy realm – otherwise known as the realm of the dead. The question now remaining to be answered is how does the horse fit in with the general reincarnation/otherworld myth? 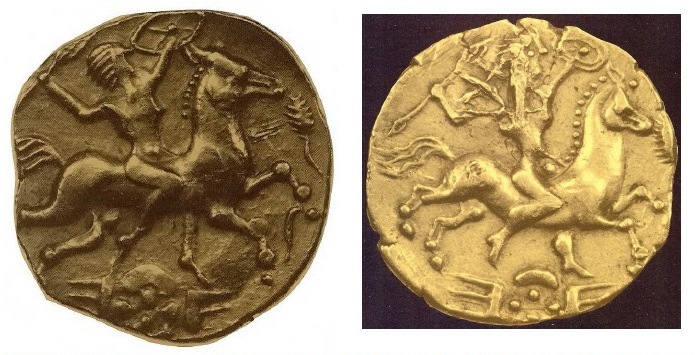 You might recall from my last post that I remarked upon the profusion of apparently astronomical imagery that accompanied the horse depicted on Celtic coins from before the Roman subjugation. Apart from the sun and the moon and obvious star-shaped figures, there are frequently dot-and-line figures with an uncanny similarity to what astronomers refer to as ‘asterisms’. The horse itself is also very stylised in its appearance, and the logical place to start in understanding the importance of the horse is to turn our eyes to the sky: The most well-known equine asterism is the great constellation of Pegasus which sits next to the Milky Way. We immediately have here an interesting combination: The Milky Way arches across the sky like a great shining white river – nowadays difficult to see clearly due to light pollution, and the great leaping horse in conjunction with this is a remarkable metaphor of the Kelpie, Nixie and Tehi-Tegi legends. However, in terms of Greek mythology, Pegasus represents the horse as a benign force, but with a very aquatic pedigree – his father is Poseidon, his mother Medusa, he is a friend of the Muses and created a magical well for them with his hooves. He is also a conveyor of heroes into the spirit realm. Already sounding like many Celtic myths, isn’t it? The Muses of course represented the ‘fairy-woman’ function of inspiring poets, keeping memory and promoting knowledge to humanity… The other less-benign and more overtly aquatic asterism that sits close to Pegasus on the other (‘southern’) side of the ecliptic path is that of Cetus variably described as a sea monster or whale. In Greek mythology Cetus/Ketos was sent by Poseidon to devour the sacrificially-chained Andromeda, and was killed by the Pegasus-riding hero Perseus who showed it the head of Medusa. Ketos in fact means any large aquatic beast, in the same way that the old Germanic languages used variants of ‘neck’ to mean the same: nicor was the Old English term used for a water beast or a hippopotamus*, and the Old High German word nihhus was used for ‘crocodile’. As a ‘*water horse’ is what we are interested in, the constellation of Cetus seems like it is worth considering further: The constellation Cetus lies in such close proximity to the ecliptic path (the road travelled by the Sun, Moon and planets in the sky, marked by the 12 zodiacal constellations) that it seems that it should be considered a 13th ‘intercalary’ member of the zodiac. Its proximity to the asterism of Pisces is intimate enough that they can be considered in the same ‘house’. Cetus is in close proximity to the other ‘watery’ constellations: Aquarius and Capricorn (the fish-goat), the ‘river’ Eridanus and the dolphin Delphinus. Now we know that the celtic high-priests were reputed to be philosophers and diviners of the heavens, so we might conjecture that celtic coins portrayed astronomical imagery. 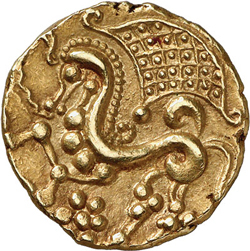 Having been puzzled by the potential relationship between the horse depicted on those famously beautiful Iron Age coins and that of Pegasus, I initially overlooked one of the motifs that accompanied it – that of the ‘tented net’ depicted on the Celtic Parisii coins. 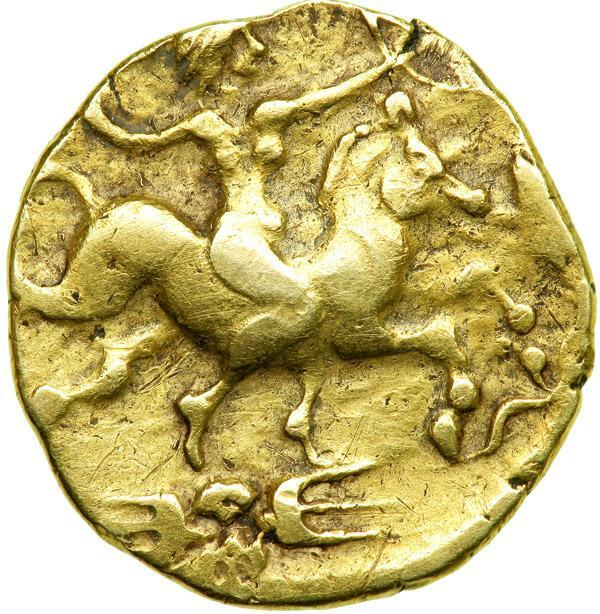 Looking eastward of Pegasus we come immediately to Pisces and Cetus – and the symbolism of the coins is made immediately clear – the horse is not a depiction of Pegasus – it is in fact Cetus, the ‘water horse’, with the net being Pisces! If this interpretation is correct, then a lost celtic star-myth has been recovered, together suggesting some potential original celtic names for their asterisms: ‘the water horse’ and ‘the net’! The subject of kelpies has been popping up for me lately. In my quest for knowledge, I came across this. It is a fascinating article on a complicated subject.